^ a b "Constitutional Law". Philconsa Yearbook. Philippine Constitution Association. 1965. Retrieved 26 September 2014. "Balangkas at Layunin ng Pamahalaang Komonwelt". Bureau of Elementary Education. Department of Education. 2010. Archived from the original on 16 August 2016. Retrieved 26 September 2014. ^ a b c Mair, Christian (2003). The politics of English as a world language: new horizons in postcolonial cultural studies. NL: Rodopi. pp. 479–82. ISBN 978-90-420-0876-2. Retrieved 17 February 2011. 497 pp. Roger M. Thompson (1 January 2003). Filipino English and Taglish: Language Switching from Multiple Perspectives. John Benjamins Publishing. pp. 27–29. ISBN 90-272-4891-5. Christian Mair (1 January 2003). The Politics of English as a World Language: New Horizons in Postcolonial Cultural Studies. Rodopi. p. 480. ISBN 90-420-0876-8. Antonio L. Rappa; Lionel Wee Hock An (23 February 2006). Language Policy and Modernity in Southeast Asia: Malaysia, the Philippines, Singapore, and Thailand. Springer Science & Business Media. p. 68. ISBN 978-1-4020-4510-3. ^ Castro, Christi-Anne, Associate Professor University of Michigan (7 April 2011). Musical Renderings of the Philippine Nation. U.S.: Oxford University Press. p. 204. ISBN 978-0-19-974640-8. Retrieved 3 July 2013. ^ a b "Philippine History". DLSU-Manila. Archived from the original on 2006-08-22. Retrieved 2007-02-11. ^ Bailey, Rayne (2009). Immigration and Migration. Infobase Publishing. p. 107. ISBN 9781438109015. Retrieved 8 September 2014. ^ Thompson, Roger M. (2003). Filipino English and Taglish: Language Switching from Multiple Perspectives. John Benjamins Publishing. p. 27. ISBN 9789027248916. Retrieved 7 September 2014. ^ Thompson, Roger M. (2003). Filipino English and Taglish: Language Switching from Multiple Perspectives. John Benjamins Publishing. p. 61. ISBN 9789027248916. Retrieved 7 September 2014. ^ INQUIRER.net. "Did you know: 1st national elections in PH held on Sept. 16, 1935". newsinfo.inquirer.net. Retrieved 2019-03-27. ^ "Inaugural Address of President Manuel L. Quezon, November 15, 1935 | GOVPH". Official Gazette of the Republic of the Philippines. Retrieved 2019-03-27. ^ "Manuel L. Quezon | Presidential Museum and Library". Retrieved 2019-03-27. ^ Villegas, Bernardo (September 18, 2015). "My Lolo Miguel, the hero". Manila Bulletin. Retrieved 2019-03-27. ^ III, Manuel L. Quezon. "OPINION: The vice-presidency: a briefer". ABS-CBN News. Retrieved 2019-03-27. ^ "MLQ's colorful language". Manila Bulletin News. Retrieved 2019-03-27. ^ Katz, Deborah. "Manuel L. Quezon, President Of The Philippines, Rescuer Of Jews". Retrieved 2019-03-27. ^ Tan, Michael L. "Quezon and TB". opinion.inquirer.net. Retrieved 2019-03-27. ^ Baron, Scott (2019-01-14). Valor of Many Stripes: Remarkable Americans in World War II. McFarland. ISBN 9781476674414. ^ "Museo ni Manuel Quezon". National Historical Commission of the Philippines. Retrieved 2019-03-27. ^ a b "Sergio Osmeña | president of Philippines". Encyclopedia Britannica. Retrieved 2019-03-27. ^ Lohr, Steve (1984-10-20). 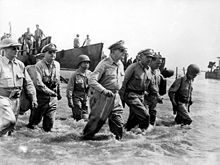 "40 Years Later, Memories of Macarthur's Return". The New York Times. ISSN 0362-4331. Retrieved 2019-03-27. ^ Mercado, Juan (September 2, 2012). "Boasting of ancestors". Sunstar Cebu. Retrieved 2019-03-27. ^ "Manuel Roxas | Presidential Museum and Library". Retrieved 2019-03-27. ^ "President Roxas on First State of the Nation Address, June 3, 1946 | GOVPH". Official Gazette of the Republic of the Philippines. Retrieved 2019-03-27. Lacsamana, Leodivico Cruz (1990), Philippine History and Government, Phoenix, ISBN 971-06-1894-6, retrieved 2007-12-28 .